Offering Gift Cards is a great way to create loyalty and keep your customer coming back to your location . 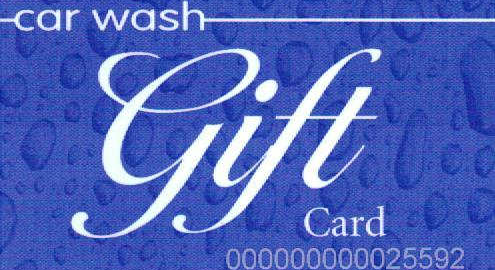 The LogicWash system allows you to sell any dollar value on the card without transaction fees. Gift cards can be created with your logo and custom printing. Despite the demand, a surprising number of cards sit idle and go unused. Americans love gift cards. We like to give gift cards as well as receive them. In fact, they’ve been the most requested item on holiday wish lists since 2007. As an industry, gift cards eclipsed $118 billion in 2013, an eight percent increase over 2012. While e-gifting fueled a significant portion of the overall growth (increasing from just $300 million in 2012 to an astounding $3 billion in 2013), traditional retailer gift card volume grew as well, rising from $36 billion to $39 billion. For small and mid-sized businesses (SMBs) gift cards may be viewed as just a ‘nice to have’, but retailers need to understand the business value gift cards can, and will, deliver to their bottom line. Just check out the following information (statistics compiled by Gift Card Granny). Retailers benefit when they sell gift cards and consumers don’t redeem them for the whole value. Retailers earn more when consumers spend more than the gift card amount and make repeat visits. Gift cards are more than a customer convenience. They are a key stimuli to driving incremental bottom line revenues and they’re a lot easier to implement that most business owners think.